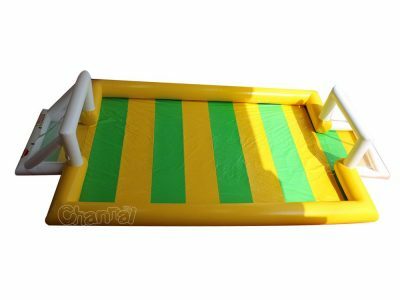 Inflatable water soccer field is a blow up soccer pitch for adults and kids to play water and soapy football game. 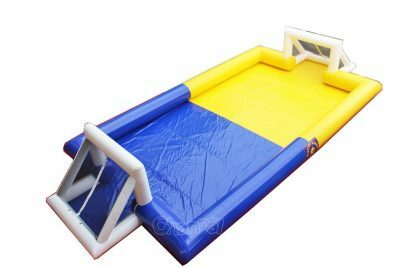 Inflatable soap football field is enclosed with inflatable walls and soccer gates with nets, the bottom can be made into bouncy house flooring or just a PVC sheet. Before game starts, wet the soap soccer field with just water or soapy water, then enjoy the fun of kicking balls and slipping down. Channal Inflatables is a professional soap football manufacturer in China. Contact us to customize your water inflatable football field at any size and design. We also manufacture inflatable foosball game with water at a cheap price.